and we will answer it! Total Hip Arthoplasty (THA), or a hip replacement, is an ever-growing facet of the medical world. First performed in the 1960s as a more permanent solution to end-stage degenerative joint disease in the hip, the prevalence of THAs being performed each year continues to sky rocket. Considered one of the “most successful and cost-effective interventions available in modern medicine”, many patients are able to return to a lifestyle of physical activity that was simply too painful to maintain before surgery. Typically, this surgery is performed at an Acute Care Hospital, such as Beth Israel Deaconess Milton Hospital, New England Baptist or Mass. General Hospital, and the patient remains in inpatient care for approximately 2-3 days. Efforts will be made to quickly get the patient moving with the assistance of either crutches or a walker. Following hip surgery, depending on the approach and type of prosthesis used by the supervising surgeon, precautions regarding certain motions or positions may be put into place for a variable amount of time. A posterolateral or anterior approach are commonly used. Your surgeon and his team will instruct you more completely in those regards. 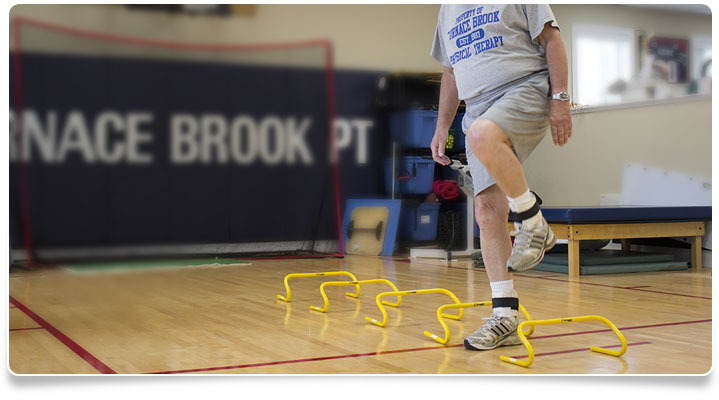 Approximately 2-4wks after the initial procedure, most patients are referred to outpatient physical therapy, such as Furnace Brook PT, to continue their rehabilitation. There, they can expect to undergo an evaluation identifying their biggest individual deficits at the time as well as education and instruction on their plan of care for the remainder of the rehab process. When the outcome is reached, patients can reasonably expect to be capable of returning to the majority of their pre-operative activity. This includes golf, doubles tennis, swimming, hiking, cycling, walking, exercising, and work. In most cases, though not set in stone, repetitive high impact activity (such as running) is not recommended in order to preserve the integrity of the implant. If you’ve had a total hip arthroplasty and are in need of rehabilitative physical therapy, you can trust Furnace Brook Physical Therapy. Contact us today for an appointment at 617-770-4167. We serve Quincy, Massachusetts and surrounding areas. Fridays 7 a.m. - 4 p.m.